Simply put, a bill of materials (BOM) is a list of the raw materials, components and assemblies needed to manufacture a product. Two different types of BOMs are the manufacturing bill of materials (MBOM) and the engineering bill of materials (EBOM). ​During the engineering phase,​ products are derived from an EBOM. This ​EBOM is the 'recipe' for product creation. It includes all the product assemblies, sub-assemblies, and other attributes of production​. The EBOM is often created from a CAD drawing, and the goal is to define a finished product. It is essential that you have an accurate EBOM for correct product manufacturing. What would happen if your EBOM was inaccurate or incomplete? BOM accuracy is critical to manufacturing. Inaccurate EBOMs would result in product errors, the need for revisions, production delay and financial loss. You need an accurate bill of materials with the right level of detail​ for the manufacturing process to be completed properly. Sample PROSTEP bill of materials in 3D PDF. Download this sample 3D PDF here. PROSTEP customer BENTELER Automotive uses SAP as its central PDM system. 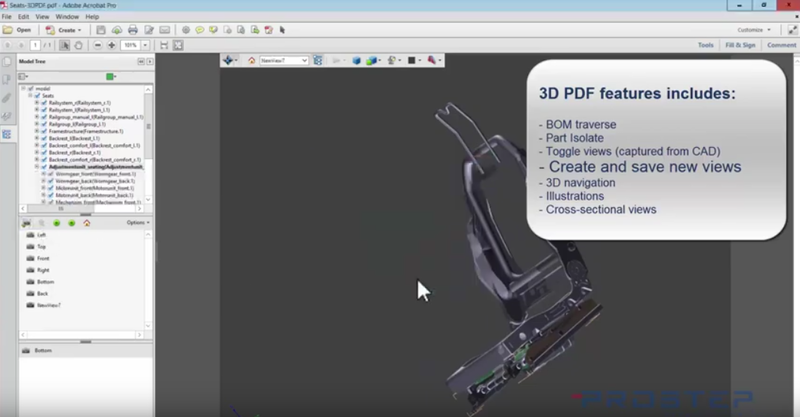 A direct integration exists to CAD systems CATIA V5, Siemens NX and PTC Creo. The SAP CAD Desktop controls the transfer of BOMs. SAP 4PEP form the backbone of the product engineering process. They connect the engineering BOMs (eBOM), variant management, document management, change process and baselining. Previously, the BOM could only be viewed in 2D. ​With approximately 20,850 employees in 20 development and sales offices worldwide and 70 factories in 29 countries, BENTELER Automotive, which is part of the BENTELER Group, develops and produces ready-to-install modules, chassis components, and parts for body, engine and exhaust systems. The Group is headquartered in Salzburg, Austria, and generated revenues of 7.5 million euros in the 2014 financial year. Most of this was accounted for by business in the automotive sector, where practically all major OEMs are customers of BENTELER Automotive. The prime focus of the division's many and varied activities, which include glass processing equipment, systems for the production of chassis and body in white components as well as forming tools, is placed on integrated lightweight construction using high-strength materials. In addition, BENTELER-SGL, a joint venture between BENTELER Automotive and the SGL Group, develops and produces components made from carbon-fiber reinforced composites for the automotive industry. The division's activities are neatly rounded off by the BENTELER Defense business unit, which – with its robust solutions –specializes in personal protection in civilian and military vehicles. 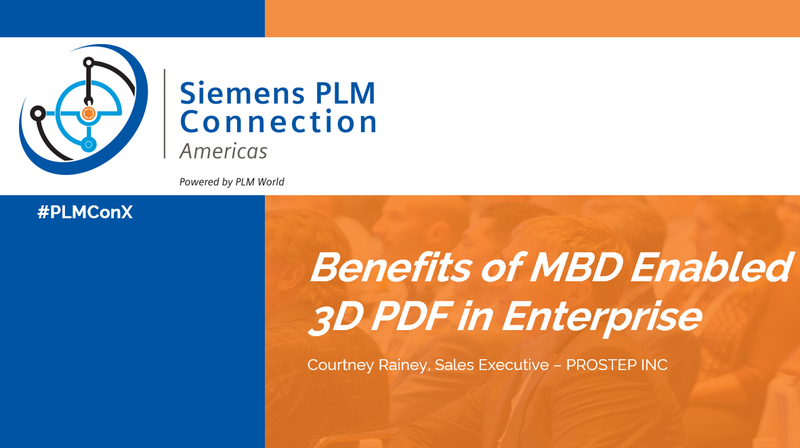 ​PROSTEP integrated its own 3D PDF technology in the product engineering process with the aim of enriching eBOMs with 3D information and allowing them to also be made available outside of SAP in a format that prevents subsequent changes from being made. 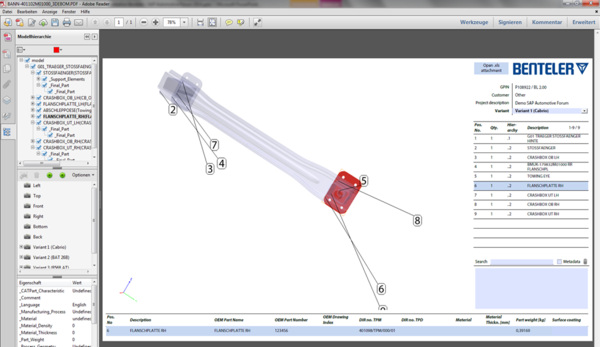 The integration allows 3D models to be exported from the CAD system together with the metadata and attribute information, to be converted and to be merged with the BOM information from the eBOM Parts Cockpit in a 3D PDF template. 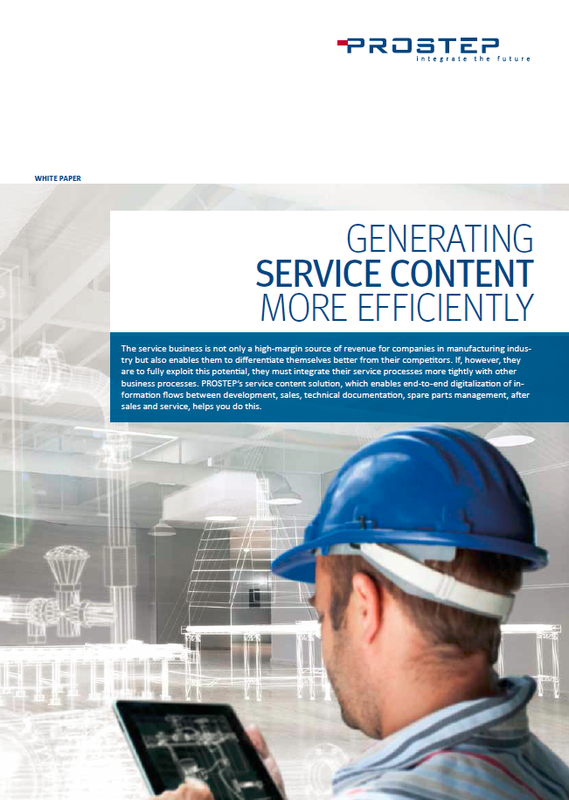 The entire process is managed by PDF Generator 3D from PROSTEP and runs automatically. What was the advantage of 3D PDF BOMs? Embedded models within the 3D PDF allowed you to interact with the model through movement, rotation, and zoom. Further, because it was a PDF format, users only needed the free Adobe Reader to view. Within the 3D PDF BOM, users also were able to see the associated project data, BOM information, and quantities of different parts of the 3D viewer window. The interactive models are linked within the PDF document with the structure information in the BOM and can be used for navigation purposes. 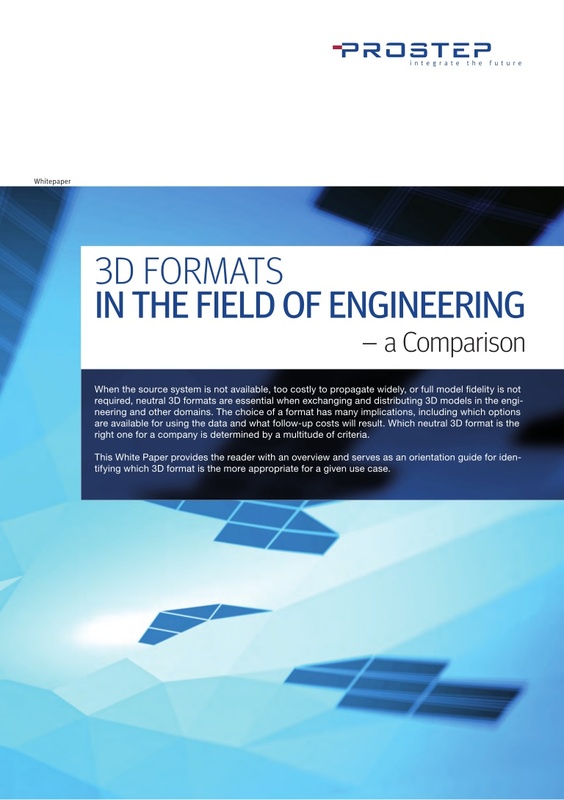 PDF Generator 3D used in combination with intelligent 3D PDF templates means that the amount of manual work required for deriving the BOMs has been reduced to a minimum despite the embedding of the 3D models. Sample PROSTEP bill of materials in 3D PDF.